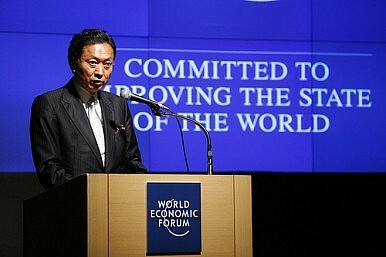 Prime Minister Yukio Hatoyama announces his resignation. Last year’s optimism has evaporated. Anybody hoping that the victory by the Democratic Party of Japan in last year’s general elections would mark the start of a new (read: normal) era for Japanese politics, and perhaps even real progress in addressing Japan’s astonishing array of structural and economic problems, will be sorely disappointed today. Yukio Hatoyama becomes the fourth in a line of hapless Japanese politicians to resign as prime minister in the last four years, following months of inept fumbling on the Futenma base issue, which he ill-advisedly put front and centre of his 2009 campaign, all while dogged by a money scandal. For now, it looks like the relatively popular Naoto Kan will take over, with the job of resuscitating the DPJ’s popularity barely a month before Japan goes to the polls for the Upper House elections. Whoever the replacement is, needless to say, he will begin without the wave of popular support that Hatoyama has squandered. There are reports that Ichiro Ozawa – widely considered the power broker in the party – will also be stepping down as Secretary General, although these had yet to be confirmed at the time of posting.